STYKFIT®6 is the new and improved TORX®. TORX® and the Bryce STYKFIT®6 are interchangeable. STYKFIT®6 bits stick-fit into most other six-lobe fasteners. (Depending on their tolerances). Pairing a STYKFIT®6 driver bit with a STYKFIT®6 screw will stick-fit, hold straight, and not strip out. Installation becomes quick and easy. TORX® and Bryce Fastener’s STYKFIT®6 are Interchangeable. 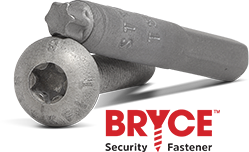 Pairing STYKFIT®6 driver bit with STYKFIT®6 screw will give the best stick-fit, hold straight, and not strip out. The “twist tapered” bit stick-fits into STYKFIT®6 screws and all other six-lobe fasteners! STYKFIT®6 Security Screw and Bit. STYKFIT®6 can be made into a security screw and bit. Though it does not add any extra security, it can be substituted for a Tam 6-Lobe and deliver the benefits above. Because the area of intersection between bit and screw is maximized, punch depths and head heights are lowered (saving weight). Head heights on socket screws is reduced by almost 1/2. Platings, coatings, heat treatments, and wear that affect screw dimensions, can be easily compensated for by slight adjustments in bit-tip lengths.